Growing up with a mother who was 50% Spanish (from Spain), I was thankfully introduced to the wonders of Spanish cooking at a young age. From Paella, to Arroz con Pollo to my absolute favorite, Chicken Villeroy – I got to experience some wonderful Spanish cooking, both homemade by my mom and my Grandma Mary and out at restaurants. Ever since I was a kid, my parents took me into New York City quite frequently (I was born and raised on Long Island, in a town thankfully only a quick 30 minute drive from midtown Manhattan). One of our favorite restaurants to go to was this little place in the West Village called El Faro. The story of El Faro goes as follows…. Apparently her grandparents had been going there for years….and that’s saying something, considering they had lived in Spain their whole lives. Despite my great grandparents liking El Faro, my great grandfather was always skeptical about El Faro’s kitchen being located in their basement…something about it he felt he couldn’t trust…but I digress. So years later, when I was born and brought up on the many delicious restaurants that my parents frequented, El Faro became a personal favorite. Despite the restaurant’s chronically surly wait staff, the food was always top notch and delicious. In recent years, we have been frequenting a new Spanish restaurant located in Midtown/Chelsea called El Quijote. No matter which place we dine at, I will always order the Chicken Villeroy. 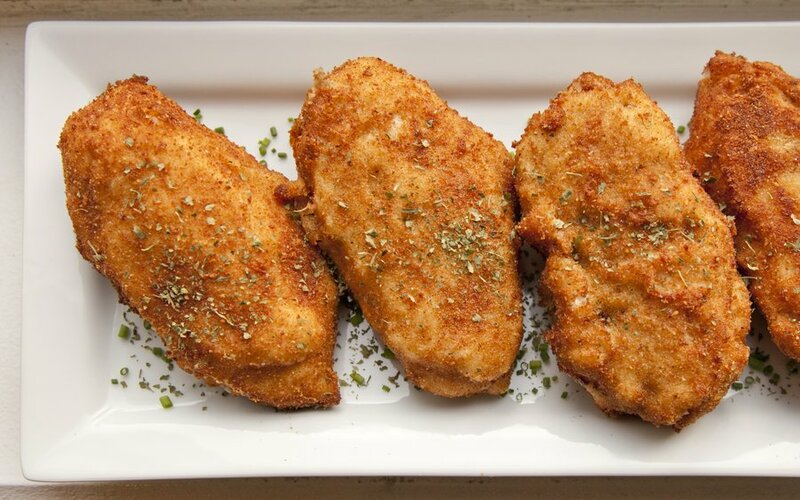 Chicken Villeroy is a whole, boneless Chicken breast, coated in a delicious and creamy Béchamel sauce, breaded and then deep-fried. 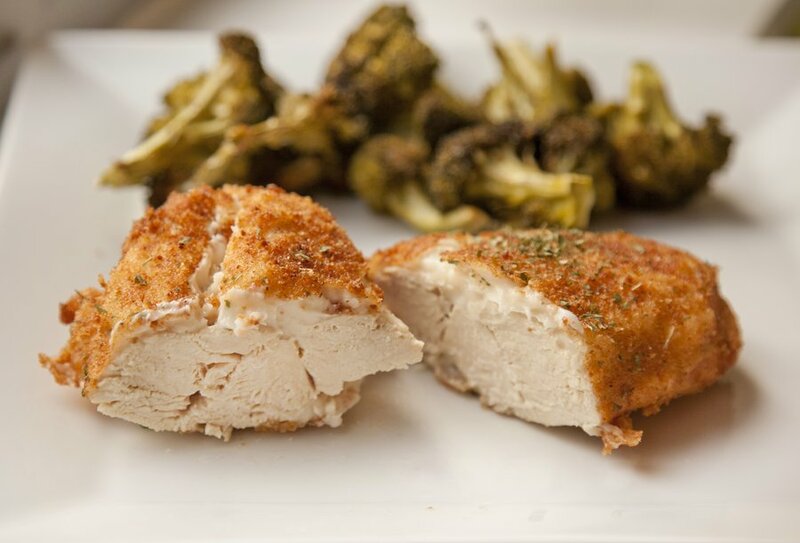 Sounds easy, but this dish takes time and patience, and a careful touch (as I learned quickly while crafting this poultry delight). So last night, I decided to attempt to make this dish, and I must say, I am extremely happy with the result! 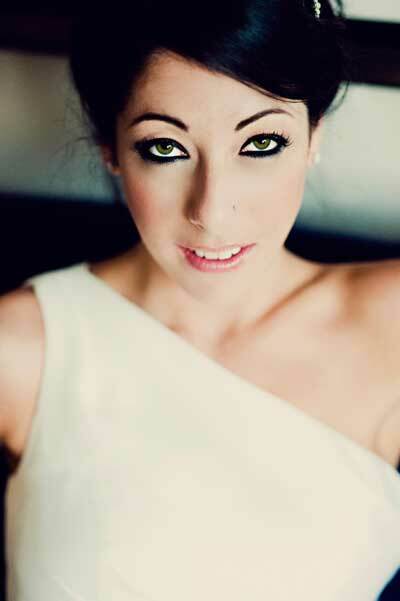 Check it out – and if you’re ever in NYC try going to El Faro or El Quijote for dinner! In a large pot, combine your chicken breasts, stock, bay leaf, salt, thyme, onion and a pinch of pepper (you want to add enough stock to just cover all the chicken). Bring to a boil, then reduce to a simmer, cover and cook 10 minutes. Turn off the heat and remove the chicken. Place the chicken on a plate to cool. Strain the stock through a fine mesh strainer, discarding the solids and reserving the stock. For your Béchamel: in a medium sized saucepan over medium high heat add your butter. Once it's melted, add your flour all at once, stirring constantly for 1 minute to make a roux. Slowly whisk in your milk and 1 cup of your reserved stock from step 1. Add in a pinch of nutmeg and whisk until it thickens - about 5 minutes. Remove from heat, taste, and season with salt. Let the Béchamel cool completely (stirring every so often). 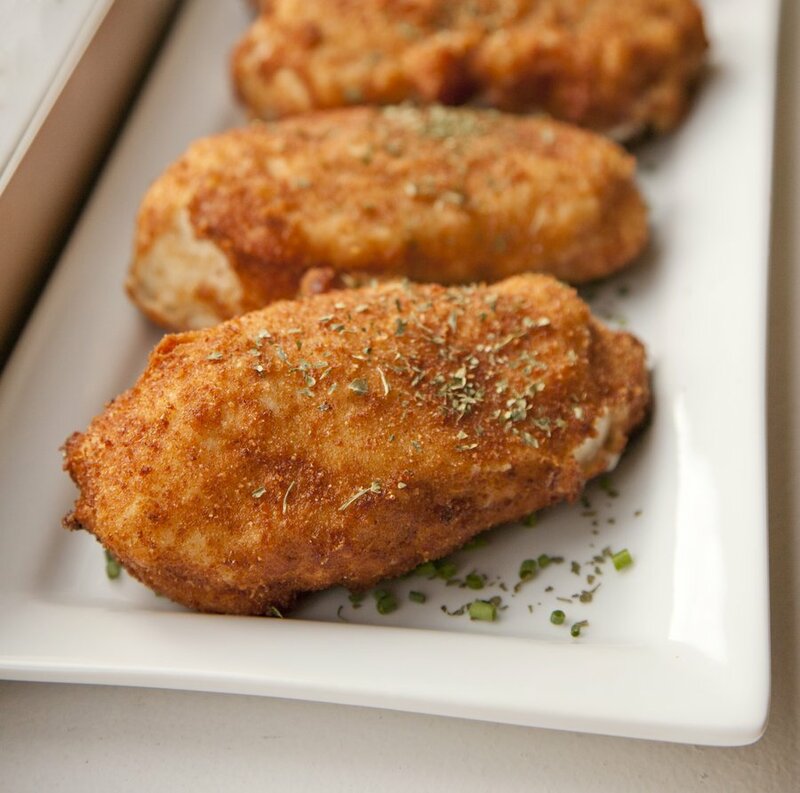 Once the Béchamel has cooled, one by one, dip your chicken breasts in the Béchamel, coating on all sides. 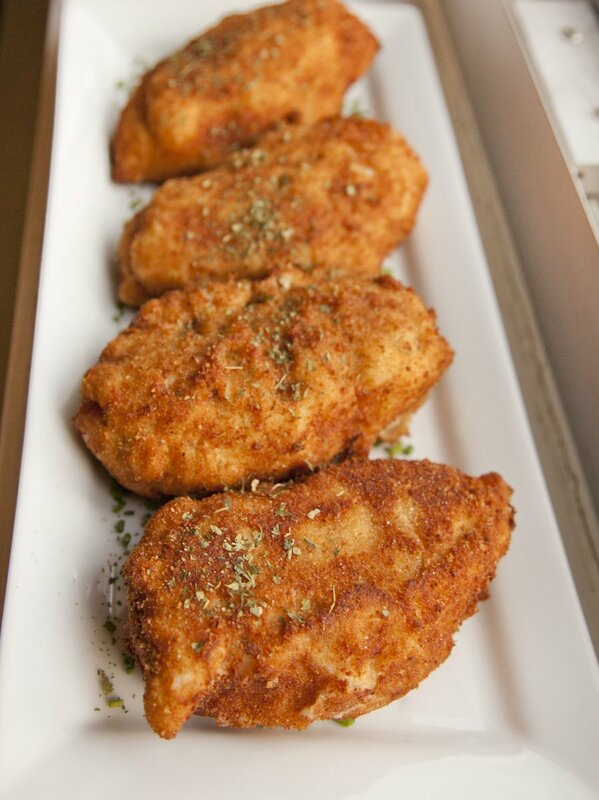 Place the chicken on a platter, and repeat with all chicken breasts. Place the platter in the fridge for at least an hour to let the Béchamel set and harden. After your chicken has rested in the fridge for at least an hour set up a breading station. In a bowl whisk together your eggs with 1 Tablespoon of milk, and a pinch of salt & pepper. On a separate dish, add your breadcrumbs (about 1 cup). Heat up a large pot of oil 3/4 way to 365 degrees. 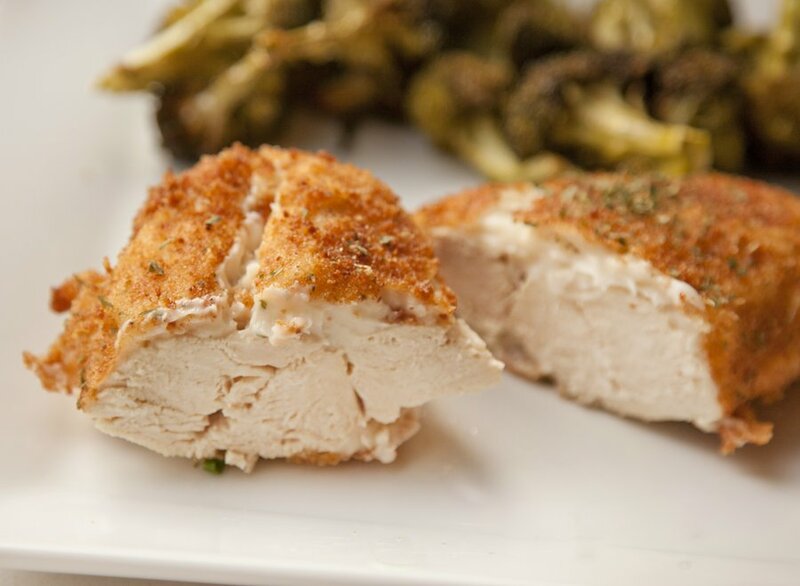 In batches, carefully dip your chicken in the egg wash, then coat completely in the breadcrumbs, and place the chicken on a new platter and put back in the fridge to harden while you finish the rest of the breading of the chicken breasts. The Béchamel will soften quickly so keep the chicken in the fridge when you're not using it. 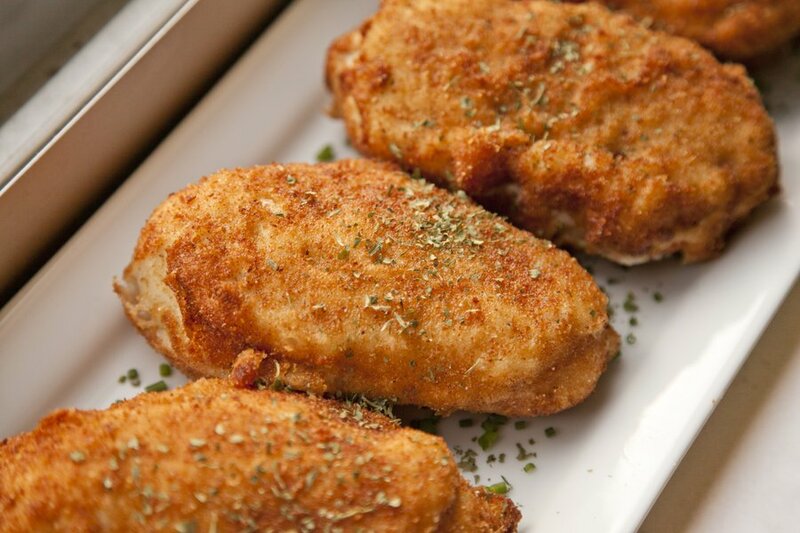 In batches, fry up your chicken in the hot oil until golden brown (3-5 minutes) - remove from oil and let drain on a paper towel lined baking sheet - sprinkle a little salt on the top of the chicken as soon as it comes out of the fryer. 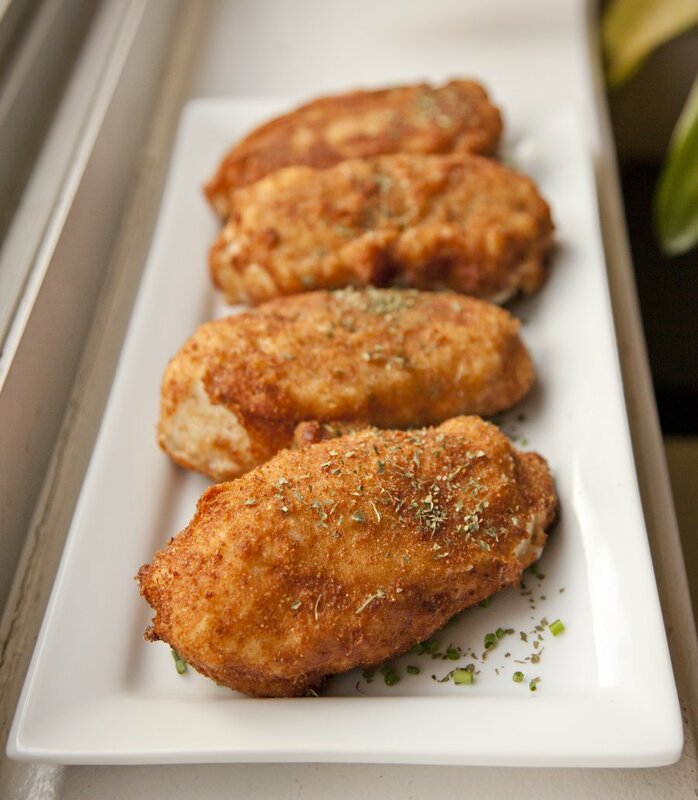 Continue to fry the chicken in batches - serve hot.